We feed our Earth Machine composter kitchen and garden scraps daily. The microorganisms and invertebrates do their decomposing jobs well because there is always space inside the composter for more scraps. But lately some decomposers were doing their job TOO well. Large balls of maggots were devouring the organic matter and overtaking the earthworms. According to the Home and Garden Info Center at University of MD, our compost had too much nitrogen because maggots (hatching fly larvae) are attracted to moist nitrogen-rich organic matter. Compost needs a 30:1 ratio of carbon (“brown” organic matter such as straw or leaves) to nitrogen (“green” organic matter such as banana peels, tomato skins, grass clippings, etc.) for efficient decomposition. Recently, a local farm gave me a bag of straw from their barn floor. Now we add a layer of straw each time we add kitchen scraps to our compost. 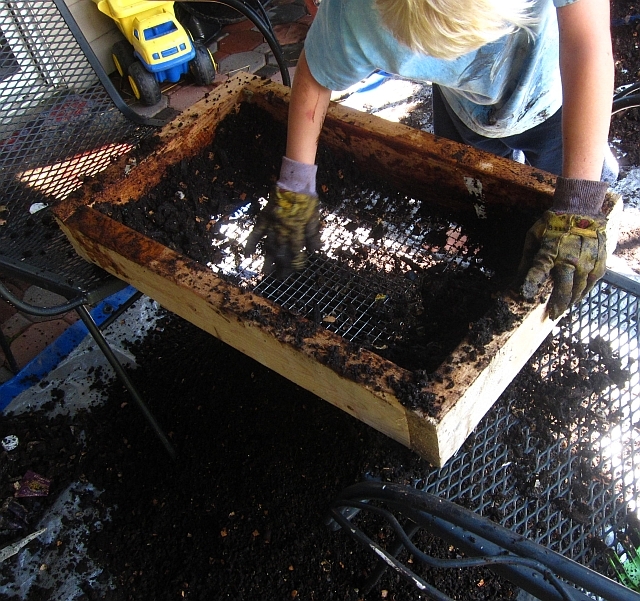 My husband made a compost sifter. We separated out rocks, sticks, nutshells and even a lost metal strawberry huller from the rich compost and humus at the bottom of our Earth Machine. He made the sifter frame from scrap 2×4 wood pieces, then stapled half inch wire mesh to the edge of the frame. We all sifted the dirt like miners searching for gold. We collected 5 pots of “black gold.” The compost we sifted is crumbly, lightweight, and spongy. There are no maggots in this bottom compost layer only a few earthworms. We spread all the “harvested” compost into beds in our community garden plot. 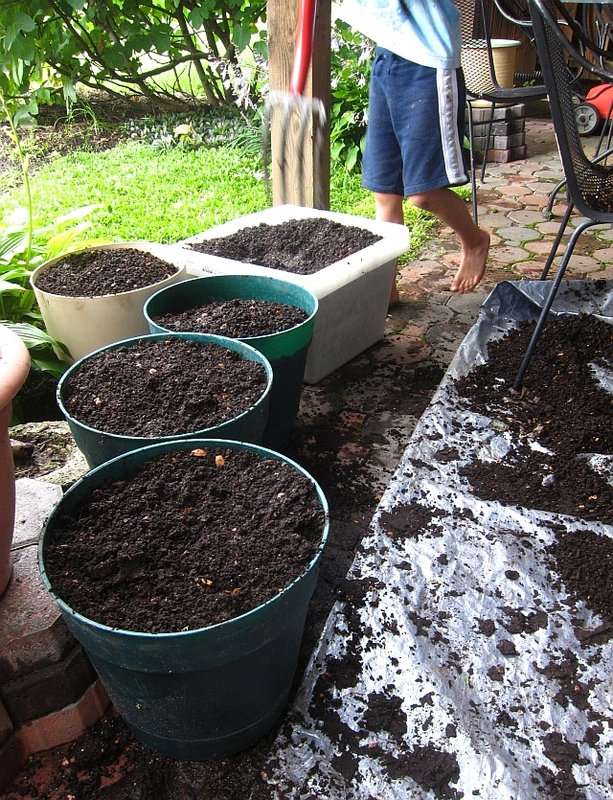 Next year’s garden will benefit from the nutrient rich compost. 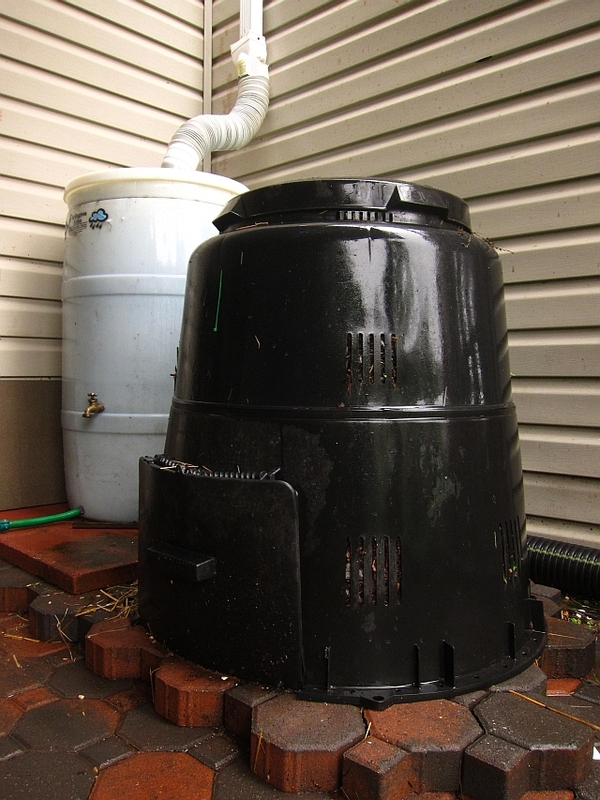 My husband turned the remaining compost in the Earth Machine to distribute oxygen and heat. This will give the beneficial compost organisms the oxygen they need to do their work and heat up the maggots and stop them from growing. Take your composting one more step and add worms to it it will make your black gold that much better. We do not have a lot of space in our townhouse. The Earth Machine is compact and keeps the compost nicely contained.